Recently, we were able to check off another item on the summer fun list. We went to see Toy Story 3. 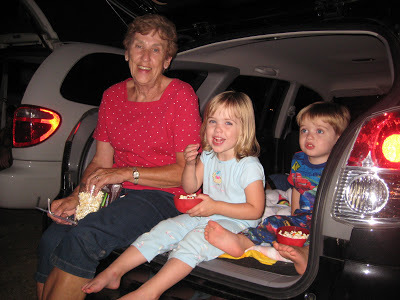 We packed up our van (and Grandma’s car, too) with blankets, a big bag of freshy-popped-on-the-stove popcorn and a few candy treats. The kids put on their PJs. And we headed out early to get a good spot, which we did, front and center. The waiting was a bit tough, but the kids did pretty well … They made a new friend and ran around a bit. Normally, they would have been in bed by this time of night. They were so excited to be staying up so late! 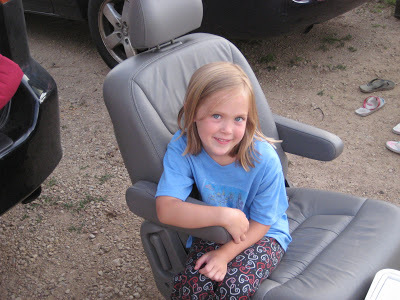 My DH took out two of our bucket seats for the adults to sit in during the show. Finally, it began to get dark, and the movie started at around 9:30 p.m. Again, way past the kids’ normal bedtime. What a treat! As the theme of growing up, of coming of age developed in the movie, I grew a little teary eyed, as I thought that one day my kids will grow up and get really big, too. Most days, it feels like that will never happen. But I know, deep down, that it will. And most likely sooner than I think. 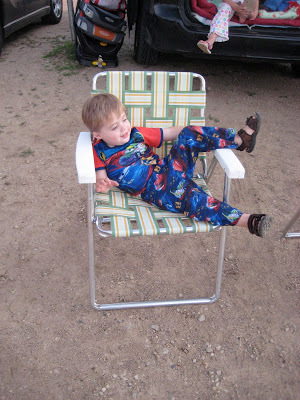 So, I held onto my own little cowboy a little tighter and savored every moment of the first drive-in movie experience with my family. A good movie. A good time together. What could be better? How exciting! 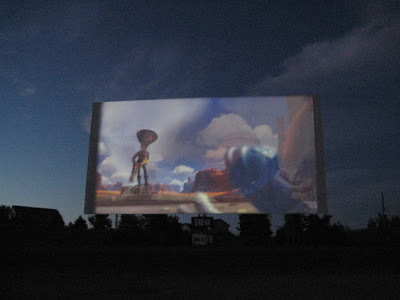 I live in Cottage Grove and there is a drive-in just down the road from us. I think the only other drive-in is in Woodbury. We've been waiting to take the kids until they're older. I just hope the drive-in is still around then. They keep talking about shutting it down and putting something really depressing there, like a Walmart. Sounds so fun! But, I have to ask, what did you do about bugs? Did you have a problem? My husband won't go anywhere outside after 9PM! It was a miracle I convinced him to see fireworks on the 4th, but he was still complaining. :( Let me know your secret. That is wonderful! That is a memory that will last your kids a lifetime. Wish we had a drive-in nearby! 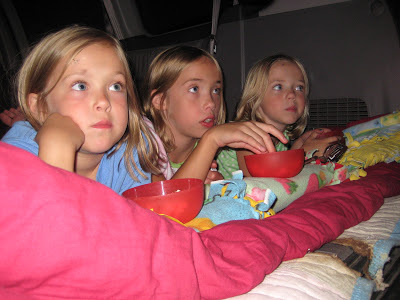 I have great memories of the Drive-In. I'm sad that we don't have one nearby. I'm glad you, your mom and the kids had fun — love the pic of the girls watching! 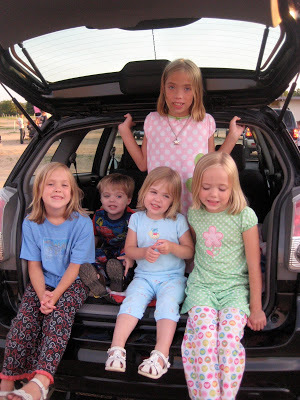 fun time, i love that they are in their jammies watching the movie. 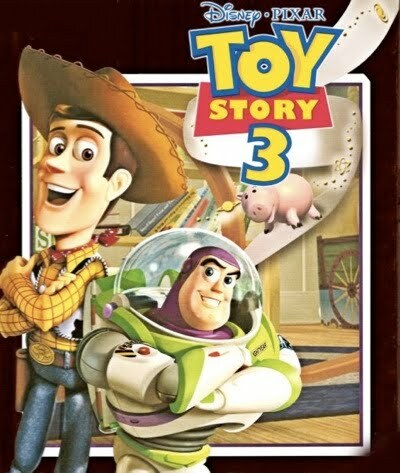 Haven't seen the movie yet…but we are fans of "Toy Story". Our local drive in closed. I'm not too disappointed b/c somehow we just get stuck around smoking people…ICK. Did you tear up at the end? I was almost actually crying!